The memory of two young sisters who were taken too soon, continues to live on in fundraising work which benefits other children in need. Last week, the family and friends of Aoife and Aine Kennedy handed over a cheque for €3,071.50 to Temple Street Children’s Hospital. The cheque was accepted with thanks by Temple Street’s Head of Fundraising, Susan Bradley, at a function in The Lodge, Carnew. The money was raised through a recent fancy dress Halloween Ball in Carnew; a monster raffle; and a children’s art competition in three local schools. Congratulations were sent to the winners of the art competition, and thanks were sent to Scoil Aodan Naofa, All Saints, and Ballyellis NS, for their great work. Congratulations were also sent to the monster raffle winners, and thanks were sent to all who supported all the events. 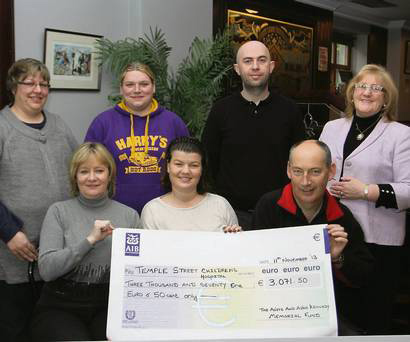 To date, the Aoife and Aine Kennedy Memorial Fund has raised over €100,000 for various causes. The charity was set up in November 2007, following the tragic death of Aoife in November 2006, at the age of five and a half. Aine’s name was added to the charity in April 2010, after she died of culture negative sepsis, also at the age of five and a half. Causes which have benefited from the money include: St. Gabriel’s Ward at Wexford General Hospital; an A&E Paediatric Unit at the hospital; St. Senan’s Primary School Autism Unit; the Cottage Autism Network Wexford; the Jack and Jill Foundation; and the Ben Kelly Fund.